The books starts off showing off Rappy’s imagination. Where would Rappy like to share his rapping skills? Rappy and his classmates are at school when his teacher asks them to get ready for a trip. Does your class go on field trips? Where have you gone or would like to go? Once Rappy arrived at the library, what was the first thing that Mrs. H made sure they did? Why? In order to borrow books from the library, Mrs. D. gave Rappy his library card. Then he started to ask all about the different types of books. What are some things you would like to read/learn about? Why did Rappy classmates fall asleep? 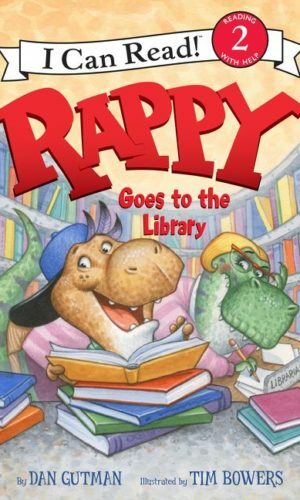 What did Rappy do to get them excited about being at the library? What do you like about visiting the library? Rappy mentions so many great book topics in this story. Go through the book and make a list of all the book topics that your child things may sound interesting. Take a trip to your local library and find books on each topic and take some time deciding if your child would like to borrow it to read at home.